In talking about large boats the tendency is to concentrate on their characteristics of style and design and perhaps to neglect a little the strictly technical part which is, on the other hand, fundamental for permitting these queens of the sea to make crossings with carefree and safe navigation. I would like, with a series of articles, to illustrate the state of the art in this line of construction and I will start from the base: I wish to talk about the bottom, which may be displacing or semi-displacing, depending on the boat's intended use. The bottom is, as is well known, the immersed part of the hull, called, with typical marine concision and efficiency, also "quick work", since depending on its different shapes it directly influences the resistance and the behaviour of the craft during its movement and represents the vital part of every boat. In the choice of a displacing or semi-displacing bottom for a large motor-yacht, as any designer well knows, but as also knows the boat owner with a bit of experience, the main discriminating factors depend on two fundamental parameters: on the dimensions of the hull and on the navigation speed you wish to obtain. These, without any doubt, are input elements that the designer receives directly from the boat owner and are the fundamental parameters on which the quick work first, and then, the internal and external layout of the boat, have to be developed. When is one or the other to be preferred? For an analysis of the choice of a specific shape of bottom, therefore, we will begin with illustrating a few, simple concepts which relate to the resistance against movement that a craft meets in the water. Wave resistance and form resistance are commonly known as residual or wave resistance. Dirty bottom resistance heavily influences the resistance of the boat, especially over time. In order to prevent the formation of dirt due to marine vegetation and microorganisms that form after long periods at sea, especially in warm waters, the quick work surface is treated with special anti-vegetative paints that must be periodically reapplied. It's perhaps a rather difficult terminology for the majority of people, but it demonstrates quite concisely and effectively the concept, understandable by everyone, that the friction resistance of a bottom increases rapidly with an increase in speed, while the wave or residual resistance decreases, at constant speed, with an increase in the length at the waterline, that is, the length measured on the "line that traces the level of the water on the boat's bottom and separates the immersed part from the emergent part". In short, the greater the speed, the more resistances build up against its movement, the longer the boat, the greater its navigation speed. Whoever has the task of designing a new ship or mega- yacht, therefore, faces first of all the problem of the consequences that the choices of the shape of the bottom and the boat's dimensions will have on the boat's power to be installed. to work out, for the desired displacement (that is, how much is to be transported) and for the speed or desired speeds, the shapes and dimensions of the bottom that will lead, taking account of the essential conditions of stability, to the lowest possible consumption of energy. The criterion for fixed dimensional limitations (which may be, from time to time, depending on the requirements of particular needs, the width, the length or the draft). The weight criterion is significant when the ship's displacement is determined by high specific weight loads, plus the weight of the hull and the motor apparatus. In this case (which only affects navigation in exceptional circumstances), the bottom must have sufficient volume to contain the total weight described above. We are here dealing with a ship with a significant draft and therefore with a high bottom volume, bearing in mind that the bottom is the immersed part of the ship. The volumetric criterion is significant when the ship has to transport bulky loads, but not of a high specific weight. In this case, once the necessary meta-centric stability has been assured, it will be possible to transport much of this voluminous load in spaces above the waterline; therefore, a large part of the useful volume will be above the waterline and the bottom will be assigned sufficient volume to stand the total weight. In any case, the problem, in its more general formulation, will be to make a certain displacement travel at a certain speed, making a bottom either of minimum possible length or of minimum power. As is always the case with a craft, a compromise that meets the ship owner's priorities has to be reached among the various requirements. The first case, of interest to ship owners, has advantages in construction costs: shorter ships however, with a worse behaviour in rough sea, are certainly more costly to operate, since the apparatus requires greater power to reach the same speed as a longer craft. The second case, of interest to the ship architect (that is, the designer specialized in the study of bottom statics and dynamics), is sometimes a little costly in the construction, due to the greater length, but significantly less expensive in operation and with a better seaworthiness. The third case, of interest to the ship owner who has to navigate the ship or mega-yacht in shoals or passages in areas that limit width, or particular restrictions that influence the length. This third case could also interest those who, having sold a certain volume (a volumetric space) to a ship owner and stipulated the relative contract, limit the main dimensions and therefore set conditions on the bottom's coefficients. This last case - at times - becomes the worst case for the ship architect, since the compromise in the choice of hydrodynamic coefficients will not be optimal. But let's take a look at the most common cases in navigation, in which speed is the priority compared to the rest. 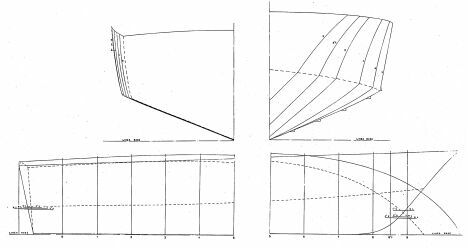 If speed becomes the principle element of the design, that is, we have a Froude's number F > 0.6 or a Taylor quotient , chine bottoms, which allow for a dynamic push and reach a high speed, must be considered. So far we have examined the resistances that the bottom meets during its movement; let's take a look now at the shapes which best meet various requirements. The shapes that a bottom can take are essentially two: round or chine. The round bottom, called a displacing bottom, has a wave resistance as speed increases which is greater than friction resistance, and as a result it's better for low or medium level speeds. Vice-versa, the chine bottom, having reached certain speeds, has a friction resistance that significantly exceeds the wave resistance. This last type of bottom, called a gliding bottom, is therefore well suited to high speeds. For crafts that for their weight, length and speed, have characteristics halfway between a round bottom and a gliding bottom, a semi-gliding or semi-displacing bottom is used. This last compromise, used for low tonnage craft, is starting to be taken in consideration also for large tonnage craft and the bottom is defined as DEEP-V. However, independently of the bottom shape, a ship must maintain her operational capacity in rough sea conditions. Experimental and theoretical techniques regarding the movements of the ship have been developed and applied. The result of this development in seakeeping technology is a more rational approach to the design of the bottom. The term "seakeeping" is used to describe the movements and correlated phenomena that affect the ship in rough sea. But to have a good operational capacity, besides what has already been mentioned, a craft must have good manoeuvrability and course stability. The fundamental consideration however remains that ship design, starting with the choice of bottom and the initial power expectations, is not only a rigorous mathematical exercise, calculated and defined, but is in fact as free and open as a creative mind could wish for. The ship is still the most difficult means of transport to design; this means travels on the confines of two very different fluids in terms of density and kinematic viscosity, and will always be the result of a substantial compromise. As a consequence, the success of a design is also the fruit of intuition and art. You can give indications, but not establish rules. This, perhaps is where the fascination of the subject lies.